Use the arch of the swords to add military tradition to your wedding. 3 How Can I Honor My Mother & Stepmother in My Wedding? 4 What Is a Bride's Proxy? Marine weddings can be an ideal way to display your mutual commitment to the armed services and your future spouse. Additionally, If you or your future spouse is part of the military currently or you have retired from the military, the marine wedding allows you to invite other officers in your unit and demonstrate your respect for marine traditions. However, many marine traditions exist regarding the invitations, ceremony and reception. Familiarize yourself with the protocol before you have your marine wedding. Ask your commanding officer for permission to marry. In many cases this may not be necessary, but it is a sign of respect. If you will be having your wedding on base, you should also ask for permission to use the area for your wedding as well as any restrictions on the use of the grounds. Talk to a military chaplain about your interest in having a marine wedding. Retain his services. Military chaplains do not charge a fee for their services. Decide upon your ceremony location. You can book the military chapel on your base or have your ceremony at another church or chapel. Be sure to ask if the chaplain can perform your service if desired. Ask permission to include marine traditions such as the arch of swords. Discuss any limitations on photography or music. Many churches will limit the type of music you can play during your wedding ceremony. You will usually need to restrict your photographer from clicking during somber moments in the ceremony. The emphasis should be on the religious ceremony, rather than on the marine traditions. Decide upon a reception location. You can opt for a military affiliated location, such as a Veterans of Foreign Wars (VFW) building or on a typical civilian reception location. Reserve the reception location as far in advance as possible. Order your invitations. Include the rank and marine service of the groom and bride if applicable when referring to them. Mention the type of dress that you will be having on the invitation or in an enclosure inside the invitation. For example, state whether it will be a formal black tie event or white tie event. Begin addressing your invitations. The ranking of each military personnel should be included on the invitation. Include an invitation for the reception to the military chaplain and his spouse. Arrange for your bridal party to wear appropriate clothing depending on the time and formality of your wedding. The bride, groom and other members of the bridal party usually wear their uniforms, although the bride may opt for a wedding dress even if she is a marine as well. White or blue uniforms are worn if the wedding is very formal like a white tie affair. Ask the bridal party to dress in dinner uniform for a black tie event. Ask your bridal party to dress in whites or blues for an informal wedding. Other wedding guests not in the bridal party may wear their uniforms as well. Order your wedding flowers from a local florist. Do not order boutonnieres with your wedding flower order because they are not permitted to be worn on marine uniforms. Arrange for an arch of swords recessional. 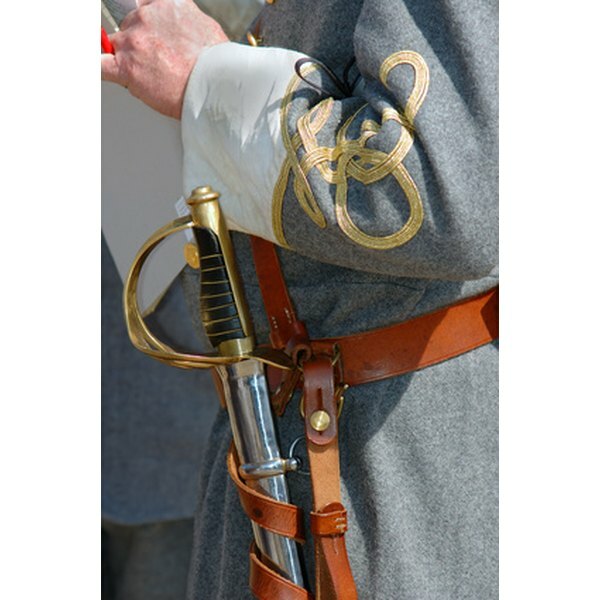 In this tradition several officers place their swords in a row in an upside-down V shape. The bride and groom pass underneath. It is also customary that the last marine tap the bride with the sword after she passes through to welcome her to the marine corps. Ask members of your bridal party to complete this tradition if they are officers. Otherwise, other guests who are officers can be asked ahead of time to complete this tradition. Ask your chaplain or honor guard to reserve the use of the swords. Order your wedding cake. Become familiar with the tradition of the groom slicing the first piece of cake with his sword and feeding the cake to the bride. The bride will then place her hand on the sword as the groom places his hand over hers to cut the piece of cake for the groom. She then feeds him the cake in return. Inform your ushers of specific seating arrangements during the ceremony and reception. The bride and groom's commanding officers should be seated as near to the couple as possible. Other officers should be seated immediately behind the families' seating. You should also make sure that officers are shown to their reception seats before the civilian guests. Reserve vendors as soon as possible. Some vendors in popular areas will be booked up over a year ahead of time. Mention that you are having a marine wedding and some vendors may offer you a discount out of respect. Inform close family members who are not military personnel about the marine wedding traditions you are implementing. This will help acquaint them with these ideas to prepare for the event.